There are a few very simple, but nevertheless very effective ways we can reduce the risk of condensation, just by simply being aware of some of the activities we would normally undertake without even thinking. In order to understand how to reduce the risk of condensation it is important to first understand how it occurs. If you have not already done so I would recommend reading last weeks article, How Condensation Occurs, before going any further. You will then understand that the ˜ingredients necessary for condensation to occur are moisture vapour and cold surfaces, which are exacerbated by poor heating and poor ventilation. Cold surfaces could be present due to thermally inefficient walls and surfaces, particularly in older buildings. In fact there are a whole host of reasons why the internal surface temperature of the internal fabric of a building may be cold (walls, windows, ceilings etc.,) including poor maintenance of external walls, rising damp, penetrating damp due to leaking rainwater guttering or downpipes, leaking roofs, single glazed windows, poor weather sealing around openings and cold bridges, which are areas of the building fabric which are less thermally efficient than the surrounding construction, and many others. To reduce the risk of condensation occurring there are two things we should consider. Firstly, dealing with the cause of the condensation and secondly, looking at the way we use a building and trying to find ways of reducing the amount of moisture vapour we emit. In order to rectify the problem, we first need to establish the cause. This is where you may need the advice of a Building Surveyor, who will be able to undertake a thorough inspection and establish which factors or combination of factors are contributing to the condensation. This is important because if you do not deal with ALL of the contributing factors, you may slow down the amount of condensation occurring, however you will not actually solve the problem. For example you may decide to improve the heating system, but if you do not deal with the thermally inefficient walls, then all of that increased heat will just disappear through the walls, and will have a limited effect. So depending on what is established as the cause, it may be necessary to increase the internal surface temperature of the walls by either insulating internally (dry lining) or externally (insulated render system), replacing windows, improving ventilation (possibly a mechanical extractor fan) and upgrading the heating system. As you would imagine, this could become very expensive, which highlights why you may need the advice of a professional to ensure that the correct remedial measures are undertaken. All buildings are different and the way we use buildings will also be different, therefore we cannot assume that the cause of condensation and the remedial works required will be the same in every situation. After dealing with the building we must also consider ways in which we can reduce the amount of moisture vapour we emit in buildings. There are a few very simple, but nevertheless very effective ways we can achieve this, just by simply being aware of some of the activities we would normally undertake without even thinking. 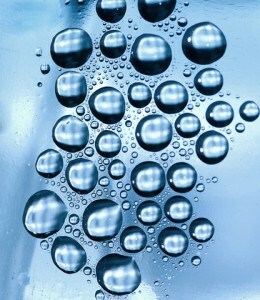 Bathing, washing and cooking are activities that we cannot avoid however all produce large amounts of moisture vapour. We must undertake these activities on a day to day basis, however when showering/bathing, try to not leave the shower or bath taps running more than you need, switch them off as soon as you can. If you have extractor fans, ensure that they are working, adequately sized and switched on when needed. Although it may be cold outside, when you are leaving the bathroom, open the window to let fresh air in, which will soon clear the moisture vapour and prevent it condensing on the walls and windows. If you are using a tumble dryer ensure that it is vented to the outside. I have undertaken a number of previous inspections where I have seen the flexible tumble dryer vents extracting into a room, rather than outside. This was due to in both cases to lack of thought of the location of the tumble dryer and a general lack of understanding on the part of the occupiers. Also, when drying clothes try to avoid placing them on top of radiators. This is usually done for convenience, however again produces large amounts of moisture vapour. Whenever possible washing should be dried outside, or if weather conditions do not permit this then consider using an appropriately vented tumble dryer, or maybe a trip to the launderette. When cooking use an extractor hood if you have one above your cooker and keep lids on saucepans as much as you can. Avoid using bottled gas and paraffin heaters these produce large amounts of moisture vapour. Finally, but very importantly, try to ensure you have a regular flow of fresh air around your house/buildings. This effectively dries out any moisture vapour and prevents it reaching concentration levels where condensation may become an issue. Granted, nobody wants to release all of that lovely heat from a building in the depths of winter, however, opening windows for a short period of time may result in the internal environment becoming temporarily cooler, but it will also significantly help to reduce the risk of condensation. Hopefully, now that you know how condensation occurs you can start to thing about ways in which you can help to reduce the risk. In future articles I will discuss other forms of damp in buildings such as rising damp and penetrating damp. Information/opinions posted here are the personal views of the author and should not be relied upon by any person or any third party without first seeking further professional advice. This content is Copyright of Gary ONeill “ © Surveying Property 2013. All rights reserved. Republished with permission of author. Gary ONeill is a Chartered Building Surveyor currently working as a Senior Lecturer at Coventry University. Prior to this, Gary worked in private professional practice for over 12 years as a Chartered Building Surveyor with the latter years in Senior Management as an Associate Member. Gary is an RICS APC Assessor. For more insights, visit Garys blog, Surveying Property.